A crown is a restoration that covers, or “caps,” a tooth to restore it to its normal shape and size, strengthening and improving the appearance of a tooth. Crowns are necessary when a tooth is generally broken down and fillings won’t solve the problem. If a tooth is cracked a crown holds the tooth together to seal the cracks so the damage doesn’t get worse. Crowns are also used to support a large filling when there isn’t enough of the tooth remaining, attach a bridge, protect weak teeth from fracturing, restore fractured teeth, or cover badly shaped or discolored teeth. You may have seen people with crowns that look “fake” or that have a dark line at the gum line of the crowns. 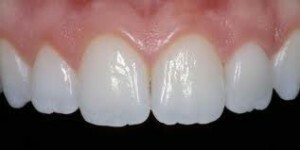 This is usually caused by the metal margin of a porcelain fused to metal (or PFM) crown. In the “old days,” many dentists used PFM crown, but now in most cases, cosmetic dentists use all porcelain crowns, which provide virtually the same strength but are highly superior in their aesthetic result.